This method, which uses the Path shelf to connect the bus stops, allows you to indicate the name of each bus stop along the route. However, the drawback is that Tableau has to draw each bus stop. For London bus routes, this means drawing 28,270 marks then connecting each of those dots for the respective route. This method, which creates a mark represented as a line for each bus route, results in only 736 marks (one for each route). That means you'll be significant performance gains. The drawback is that you lose the detail of each bus stop. It depends on the granularity you need. If plotting each point is important, the go with method A. If aggregating to the route is ok, then go with method B. For this use case, I wanted to test both options. 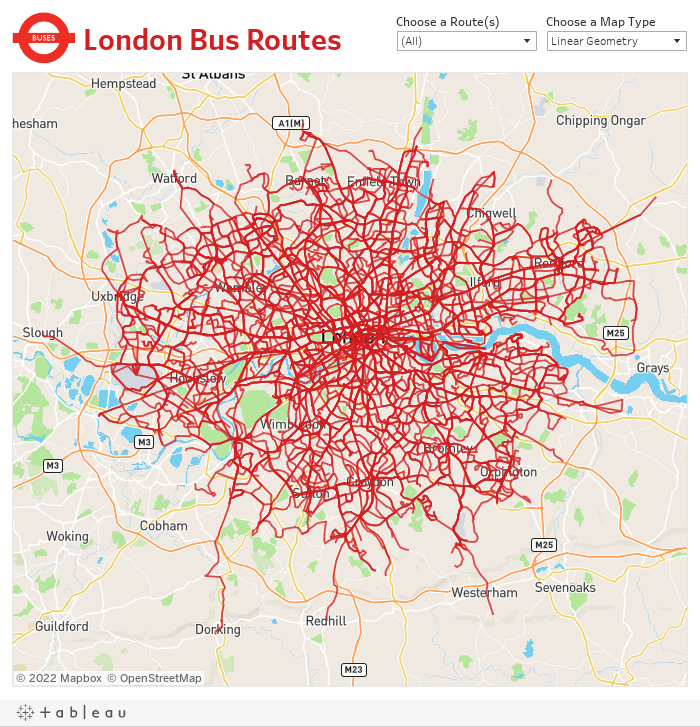 First, I went to the TFL website to download the data of every stop for every bus route (requires an account). The data comes as a CSV with eastings and northings, so I turned to my friend Alteryx for converting these into shapefiles. I used this tip by Rob Suddaby from when he was in The Data School to convert the Eastings and Northings into a spatial object. From there it's simple to create either the linestrings for the entire route or points for each stop. A quick Mapbox map added for context and we're done! One additional twist I added was to size the bus routes on the map based on the number of routes selected. This only works on the map with each individual stop. I'll be sharing this tip during my TC session in Vegas. 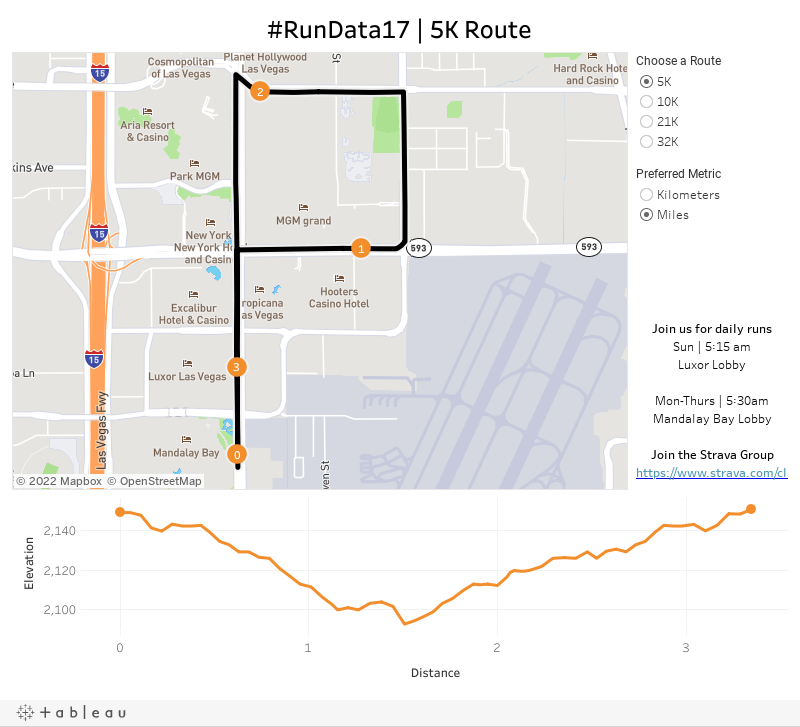 Tableau 10.4 came out this week and with it support for linear geometry shapefiles. This feature makes visualizing routing data so much easier and faster. You no longer have to plot each point, change the mark type to line and play a game of connect the dots. Now, connect directly to your shapefiles and you're done! Of course, I had to play with it. I went to the US Census website and downloaded shapefiles for every primary and secondary road for each State. With a couple clicks, I had an incredible map showing all of these roads. I wanted to highlight interstates, so I made them blue. 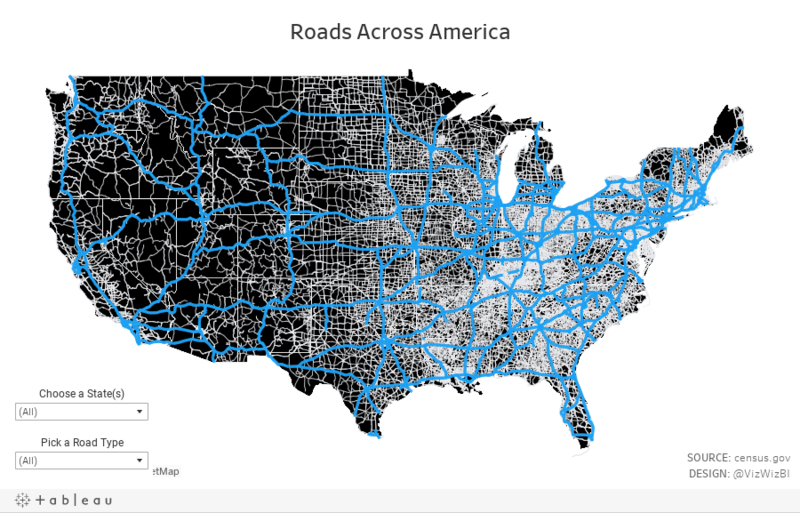 62,000 roads plotted with only a couple of clicks. Amazing! Have a play with it yourself below! I'm excited about what boxes are now opened with this new capability. 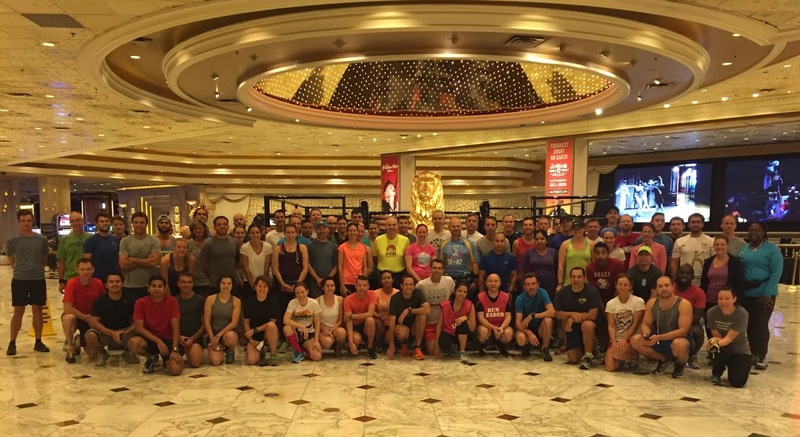 Workout Wednesday: Are the contributions of top sellers increasing throughout the year? How much the maximum selling product sub-category accounts for in a given month. How much that contribution has changed throughout the year. The idea being that you would hope that irrespective of WHICH sub-category is the top selling, the contribution of the top selling product would remain steady. It's generally not good for one sub-category to account for too much in sales because then it could be a sign that you need to diversify. (Correct me if I'm wrong please). The line chart shows how the contribution of the top selling sub-category within each month has changed since January. That means you'll need to first figure out the value of the top selling category, then figure out the contribution of that sub-category within each month, then figure out how that contribution has changed compared to January within each year. Label the ends of each line. The label need to be right-justified horizontally and center-justified vertically. The label MUST NOT overlap the line at all. Match the format of my numbers. Match the title (easy peasy, just write what I wrote). Product categories are listed down the left. Years and Months are listed across the view. If you have any questions, let me know. 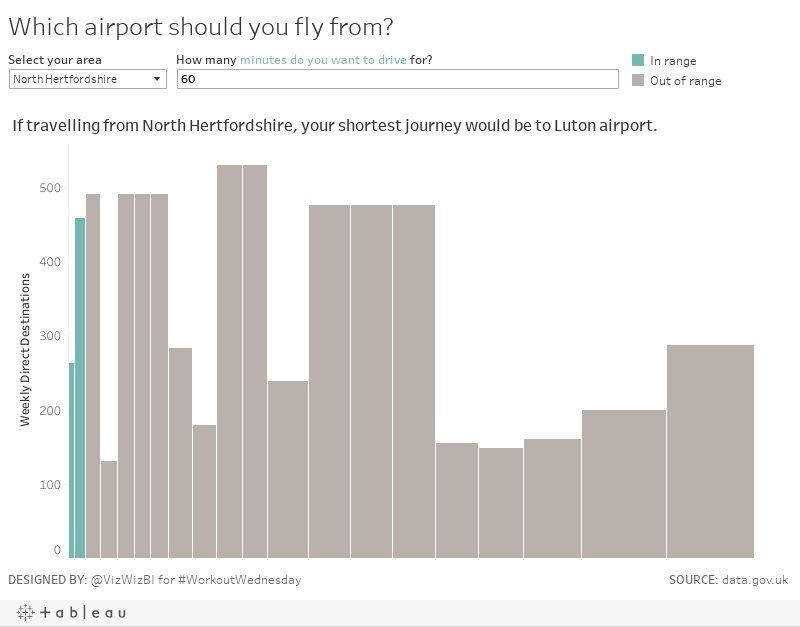 Please tweet a picture of your attempt, include a link to the viz on Tableau Public and be sure to tag @EmmaWhyte and @VizWizBI. Have you ever wanted to learn from a Zen Master for free? Well here's your chance. 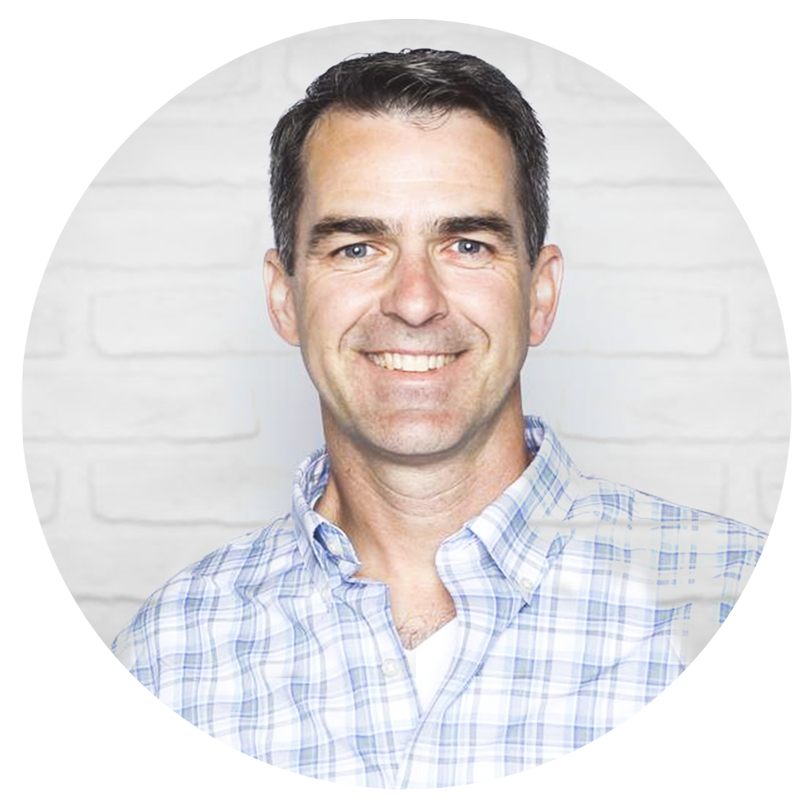 Join us for The Information Lab Europe Tableau Zen Master Webinar Series with me, Chris Love and Craig Bloodworth. 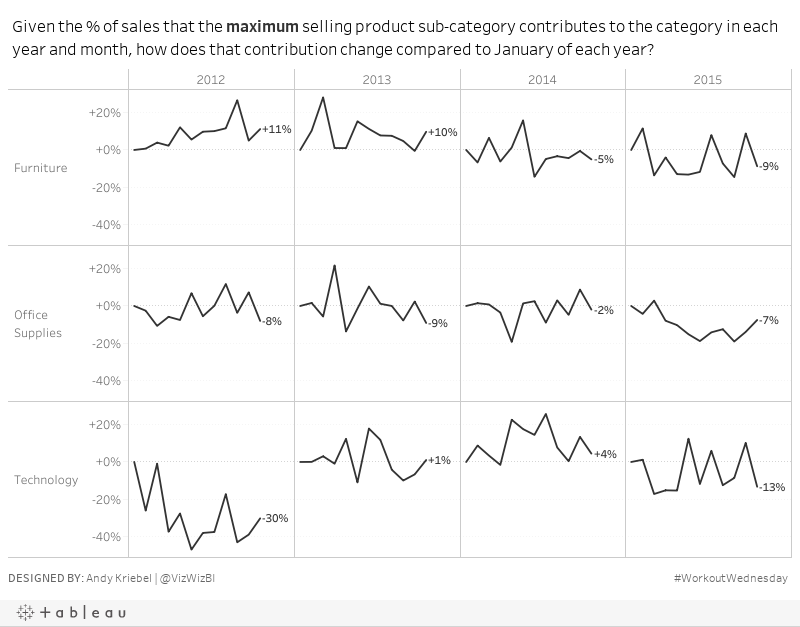 We'll be sharing our love for Tableau in three webinars starting in October. Yesterday I saw this great dot plot from Jeff Plattner and thought I'd see if I could replicate it for practice. 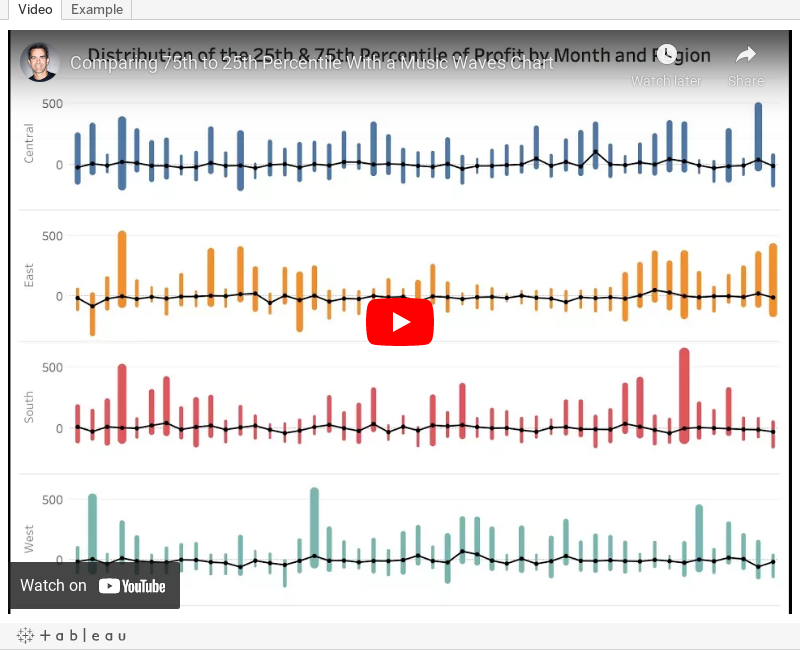 Jeff used this video from my Tableau Tip Tuesday series to create his dot plot. I love how clean his design is and I hadn't built something like this in a while so I thought I'd give it a go. I chose a color scheme that matches the Nielsen colors, but otherwise, it's pretty much identical. Thanks for the inspiration Jeff!! 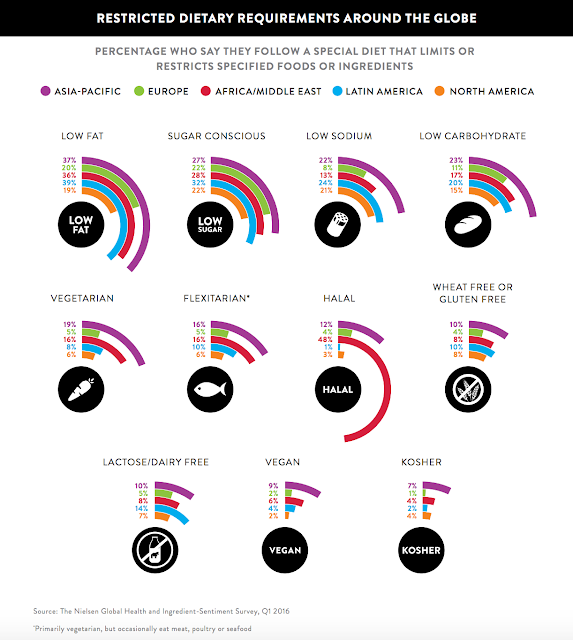 Comparing the length of arc is difficult, especially across diet types. The icons are not needed since each diet is already labeled. The story in the data is lost as it's not included along with the charts. Simplify the visualisation; bar charts are a good place to start. Turn the text from the previous page that explains the findings into a story of some sort, probably long form and not story points. With those goals in mind, here's my Makeover Monday week 39. 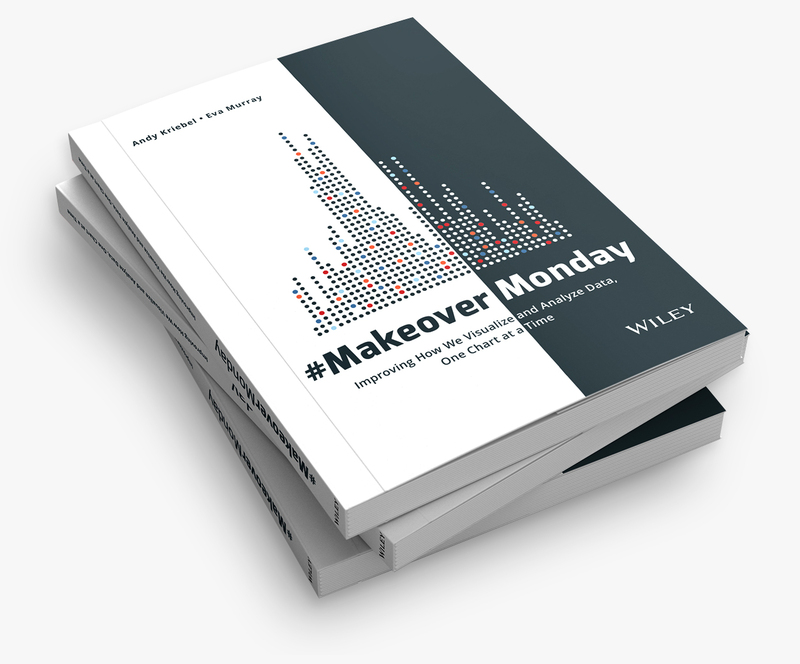 During Makeover Monday week 38, Suraj Shah created what might be one of my favorite Makeover Monday vizzes ever. With his permission, I wanted to try to remake his viz with a different data set. On the last day for DS6 at The Data School, they had a two hour task of creating a viz with the Chicago Taxi data that we used for MM week 6. I figured this might be a perfect data set to give it a go. I don't like mine nearly as much as Suraj's. It sure was fun creating it though. It took me about 45 min total. There's nothing very complicated about the viz itself, and it's probably this simplicity that I like the most. Thanks Suraj for the inspiration!! Click on the image below for the interactive version. 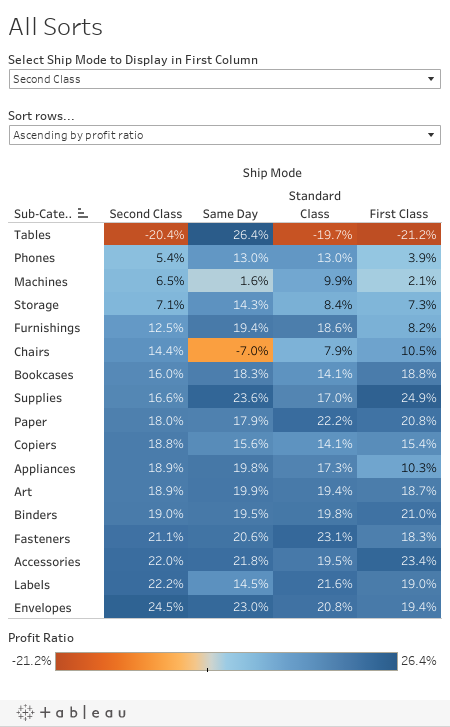 Create the highlight table showing profit ratio by ship mode and sub-category. The columns should be sorted by the ship mode selected in the drop down first, followed by the remaining ship modes sorted descending by their overall profit ratio. The Product Subcategories should be sorted ascending or descending (depending on end user selection) of the profit ratios for the selected ship mode. For me, the last requirement was the trickiest part. In the end, I had to create two parameters and three calculations. As Eva already outlined, yesterday was race day for both of us. 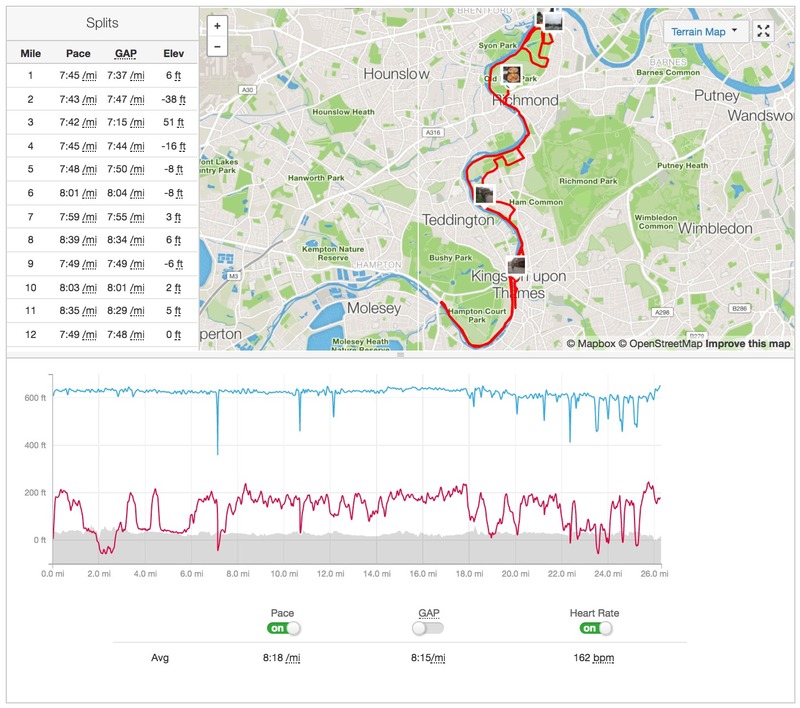 While she was at the Age Group Sprint Distance World Championships in Rotterdam, I was running the Richmond Marathon in preparation for the Frankfurt Marathon at the end of October. Given there's also the #FitData17 challenge we thought we'd give everyone some data to play with. I'm going to be making over my results from Strava. Of course no run is good without a map. There are no markers on the map to show me where I started, ended nor any mile markers along the way. The table shows me my pace, but it doesn't add any value because I can't see all of the miles at the same time making spotting trends impossible. The line chart has three separate metrics showing, yet only one axis. It doesn't make sense to overlap three metrics. What I wanted to learn? Is my 3:25 goal for Frankfurt achievable? Is there anything interesting in the heart rate data? I want to be able to compare the key metrics across the two races. Is hitting "the wall" avoidable? I must admit that I need to dig into this data further in order to be able to answer these questions. However, time is running out on the day and I won't have time to look at it more tomorrow, so I'm starting with a viz that does some simple comparisons. It'll have to do for now and it certainly improves upon the original. 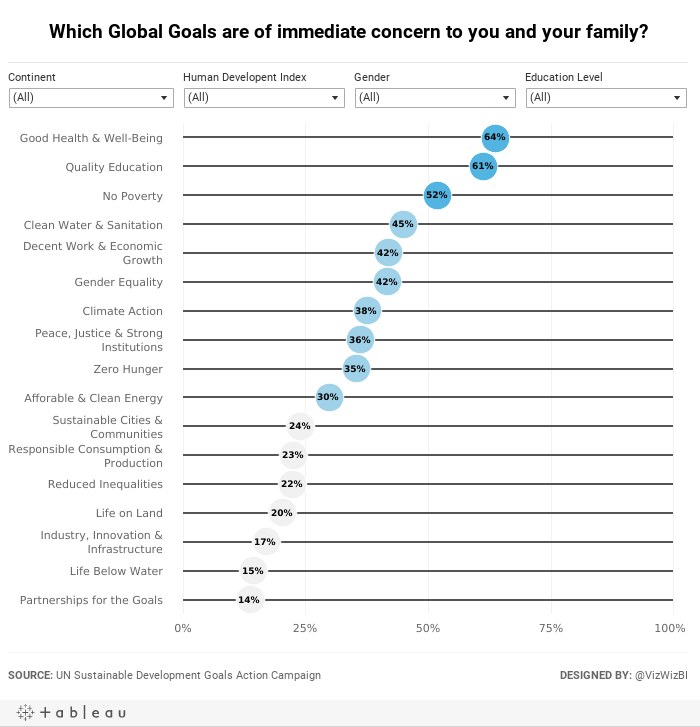 A few weeks ago on my Data Viz Done Right website, I highlighted a great viz from The Upshot that I thought was an exceptional design and told a great story. 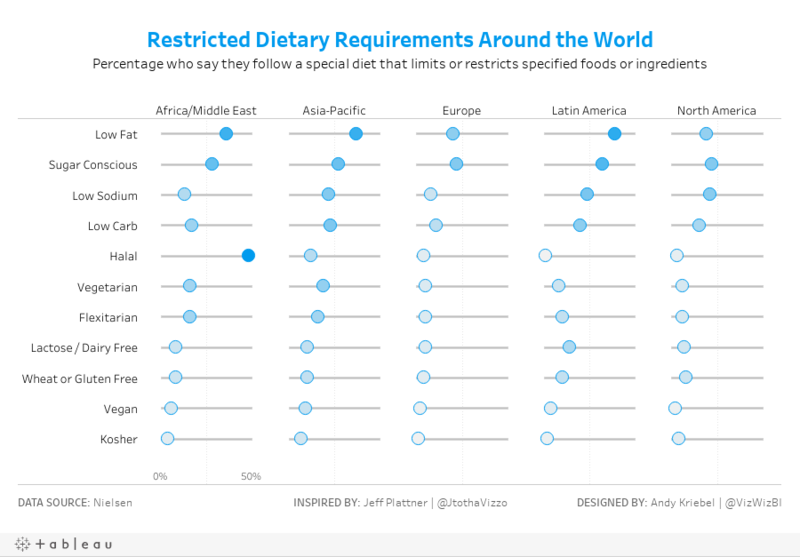 I like to use vizzes like this for inspiration to see how tough they are to build in Tableau. So that's your challenge for this week. Yes, it's waffle charts again, but I had this post ready to go before Emma stole my thunder in week 34. Make sure you credit the data source and credit The Upshot for inspiration as I have. For each city, there should be two waffle charts. The first should show the overall percentage of justified killings. The second waffle chart should show the percentage justified when a white person killed a black. 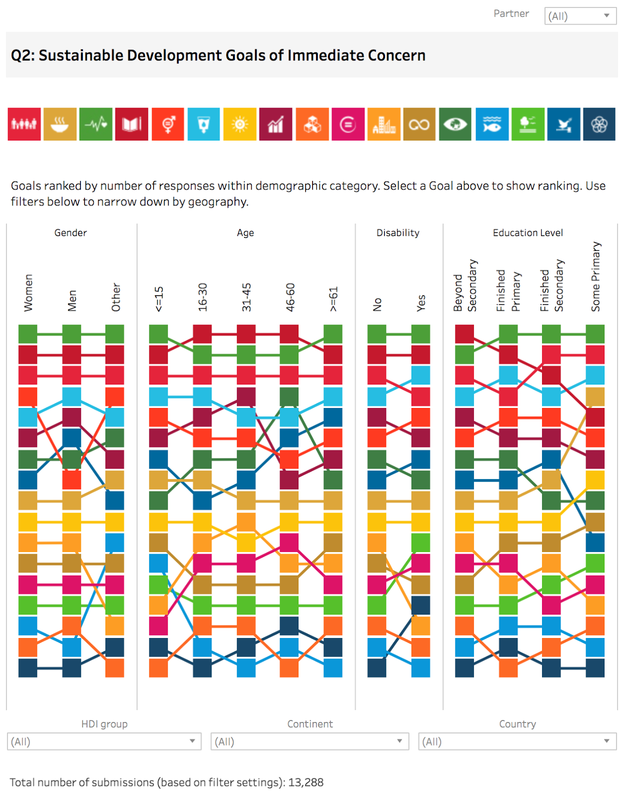 Match the text under each waffle chart. Note that the text must be in the same worksheet and the percentage displayed must be based on a calculation. The text above each pair of charts should span across the two waffle charts for that city. There should be a 20 pixel buffer between each row of charts. There should be a 20 pixel buffer between cities that are on the same row. Use hex code #CC0000 to represent the percentage justified and use #ECECEC to represent the unjustified killings. Match the layout exactly for the text boxes. Everything MUST be tiled; no floating elements allowed. I used the Benton Sans font, but that won't render on Tableau Public, so use whatever font you wish. Benton Sans helped me get the word wrapping and spacing just like The Upshot had it. By the end of this exercise, you should be much more familiar with layout containers. Personally, I love containers because I know how to manipulate them well. Hopefully you'll feel the same by the end. Make sure you tag @VizWizBI, @EmmaWhyte and @TheUpshot (for their inspiration) when you tweet your final work. Also include a link to your dashboard. Lastly, this is not particularly difficult, there are no crazy calculations, it's more a tedious exercise. Have fun! Having recently purchased a nice road bike for commuting to work and looking into registering it with the police, I ran across the great Stolen Bike UK website where people can report their stolen bike, see what's been reported and get more information about what's going on overall. For this week's makeover, we're looking at the page where you can search a specific postcode. Given I ride to work, I naturally entered our work postcode and got this visualisation. The search feature and map are very engaging. I wanted to zoom all the way in to work. 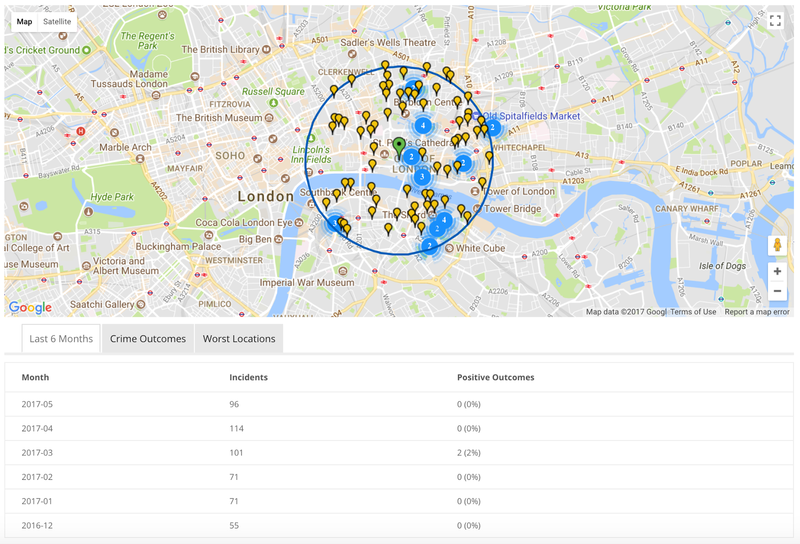 The result set is within a mile of the postcode I entered, providing context and relevancy. The map is easy to use. Click on a marker and you get a bit of information about the incident. Using a map shows the volume of stolen bikes well. The table and tabs provide a simple way for me to lookup information. Clicking on one of the numbers on the map doesn't then drill into each of those incidents. The Last 6 Months tab doesn't show trends well. The Worst Locations tab isn't very useful if you not very knowledgable about the area. All of the tables would be more impactful as charts. What are the worst areas in the UK? Is bike theft increasing or decreasing overall and in specific areas? Are there as few positive outcomes as it seems? Where should I avoid locking up my bike? Is there any seasonality in the data? My hypothesis is that the number of bikes stolen would reduce in the winter months. To answer the first question, I downloaded the police force boundaries from data.police.uk and merged all of the KML files together with Alteryx and output the result as a single shapefile. From there, I blended the shapefiles with the bike theft data to create a map showing the log scale of bike thefts by police force. I chose a log scale because London is a crazy outlier. With the questions in mind above, here's my Makeover Monday week 37 which I've optimized for mobile consumption. Create percentile calcs and place them on the same axis. The date field must be discrete. Use Measure Names on the Path shelf. There are some other subtleties that you'll pick up on the video as well. Enjoy!